Arch. Teofilo B. Camomot, D.D. In 1943, he was appointed parish priest of Sta. Teresa Parish in Talisay, Cebu. He lived a simple and austere life. Before celebrating mass he visited all the sick parishioners while attending to their needs. On March 26, 1955, he was named Titular bishop of Clisma and auxiliary bishop of Jaro, Iloilo. Bishop Teofilo B. Camomot was born in Cogon, Carcar, Cebu on March 3, 1914 to Luis and Angela Bastida. He was the third child of eight children and was baptized on March 4, 1914 and confirmed on August 22, 1915. He dedicated himself wholeheartedly to his seminary formation at the Seminario de San Carlos in Cebu City. On December 15, 1940, he was ordained a priest and was appointed assistant to different parishes. In 1959 he became co-adjutor Archbishop (c.i.s.) of Cagayan de Oro and appointed parish priest of Sta. Rita, Balingasag, Misamis Oriental. Here he founded the Carmelite Tertiaries of the Blessed Eucharist (CTOBE), presently, the Daughters of Saint Teresa (DST). In 1968, he had kidney surgery and had to take rest. He resigned as Co-adjutor Archbishop of Cagayan de Oro on June 16, 1968, went back to Cebu in 1970, and became auxiliary of Julio Cardinal Rosales who appointed him parish priest of El Pardo, Cebu City. On February 19, 1976, he was named parish priest of Carcar, Cebu, his hometown while also serving the archdiocese in other areas of responsibilities. On September 27, 1988, he died on his way back to his parish in a vehicular accident at San Fernando, Cebu. True to his name, TEOFILO, which means lover of God, he lived all his 74 years on earth serving and loving God and all people particularly the poor, the sick, the homeless, and the suffering. Cebu archbishop emeritus Ricardo Jamin Vidal announced last October 15, 2010 that the Holy See have approved the opening for the cause of beatification and will pave the way for the examination of the life of Archbishop Camomot. Archbishop Ricardo Cardinal Vidal formed the commission to look into the possibility of beatification last December 27, 2010. Members of the commission are retired Bishop Antonio Ranola, Monsignor Dennis Villarojo, Monsignor Raul Go, Rev. Jasper John Petralba, and Trinidad Calleno. His simplicity was attested by so many people even fellow prelates. There were many stories about the Archbishop’s Francisan-like poverty. 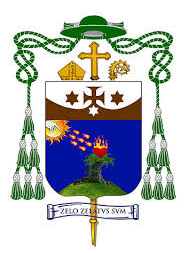 Cardinal Vidal have once told that on one occasion he noticed that Archbishop Camomot was not wearing his pectoral cross, the cross that a bishop wears on his breast. Curious, he asked Monsignor Camomot about it. He made some excuse. Later a priest told the Cardinal that the Archbishop had pawned his cross to give some money to the poor. The Cardinal later gave him a new cross and told him not to give it away. Vidal said there were several testimonies about Camomot’s bilocation or there were people who would see him present in two places at the same time. The archbishop himself has signed an affidavit in relation to a witness’ account on this phenomenon where Camomot was sleeping beside him at a meeting of the College of Consultors. “I have already authenticated his presence at a meeting. But a woman said at that time he was on a mountain (in Carcar) giving the last sacrament to a dying person,” he said. “He (Camomot) was at my left, and Archbishop (Manuel) Salvador– discussing about the pastoral (thrust) of the diocese–at my right. I said ‘Monsignor, we have a votation and you have to vote,’” he added. Cardinal Vidal said the investigation into the life of Camomot would continue even after his retirement. He assured that he will hand it over his successor, Archbishop Jose Palma. It was said that his body remained incorrupt twenty years after his death.